With Baby Ashley growing up right before our eyes it is time to start feeding her "real" food. I think that I am holding on to the baby stage a little longer on this one and so I have been slacking on the start of introducing solids. I found a great product in Ella's Kitchen to help me get started. Ella's Kitchen is 100% organic food for babies and toddlers. Ella's Kitchen has a great selection of food products such as First Tastes, Fruit + Baby Rice, Smoothie Fruits, and more. With cute names like "The Red One" and "The Yellow One" you will want to check them out. Every pouch is labeled with the age range for the food and it's contents. Each one is 100% organic with no additives or water, just yummy organic food for babies! Ella's Kitchen products were perfect for our road trip. They are just the right portion size, easy to squeeze onto a spoon and the baby ate them right up.I love knowing my baby was eating healthy and organic while we were away from home, just because we were traveling does not mean that we need to skimp on proper eating. Another great travel tip is you can also take them on a plane with you while you travel with your little one. We just love Ella's Kitchen and I know you will too!! 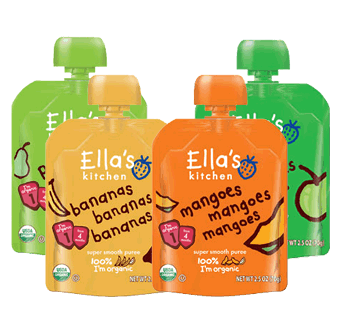 Win a box of Ella's Kitchen food pouches. What other products from Ella's Kitchen would you like your little one to try? I also would like to try their Apples & Strawberries Nibbly Fingers! Would like to try the Yum Yummy Baby Cookies, Milk & Vanilla! I would like to try the Yum Yummy Baby Cookies, Milk & Vanilla! I would like to try the nibbly fingers snacks forout toddler! She loves the pouches! The milk and vanilla baby cookies look good! I would like to try their banana baby brekkie. I'd like to try the new baby cookies! I would love to try the Milk and Vanilla cookies! Great giveaway! Like Ella's Kitchen on Facebook as Sonya Morris. Like your new fan page as Sonya Morris. Follow FrugalFamTree on Twitter as catholicfanatic. i think id like my little one to try the mango and carrot nibbly fingers!